Before the start of each hurricane season, weather scientists from places like the National Weather Service and Colorado State University issue their predictions on the severity of the upcoming season. Their predictions include the number of total storms, number of named storms, and the number of major hurricanes we are likely to see from the Atlantic Ocean. They formulate their predictions by looking at volumes of data, historical trends, and computer analysis of what different causal weather factors (like water and air temperatures and wind patterns) are likely to look like through the hurricane, projecting what effect they’ll have on the formation and severity of hurricane season storms if their projections accurately come to pass. Now that we’ve been into hurricane season for a couple months, weather analysts have more information available to refine their projections. And that’s what they did in July and August. What did their refined predictions portend for the rest of the 2018 Atlantic hurricane season? After a period of relative calm, we've recently had some activity crop up. Hurricane Gordon made landfall in the last couple of days, weakening to a tropical storm as it moved inland through Alabama and Mississippi. Eventually it will end up around Chicago and northern Indiana as it continues to lose strength and eventually dissipate. Gordon is the 7th named storm of the Atlantic season, which (as you can see below) puts us past the halfway point for the projected number of storms this season. And yet, in the heels of Gordon, we've now got potential Hurricane Florence. As of Wednesday, she was out in the Atlantic, heading towards the East Coast and bringing lots of rain with her. Florence is the first MAJOR hurricane of the 2018 season, packing sustained winds of 120 mph. That makes her a Cat 3 at this time. Meteorologists predict that, because of her early northern position, Florence may not end up posing a major threat to land. She also has weather conditions like dry air and wind shear that could weaken her over Thursday and Friday. But you never know about these things, and these same meteorologists warn that Florence could end up re-intensifying over the weekend as she hits areas of warmer water. We should all have a clearer picture of things next week. Storm activity has been downgraded to 12 named storms (of which we’ve already had a few, like Beryl), five hurricanes and one major hurricane. These numbers are slightly lower from the projections at the start of the season. The number of storms (12) is right in line with historical averages, but the number of hurricanes and major hurricanes is lower than the typical season, which sees an average of 6 and 3 of those. What, if anything, changed to lead weather scientists to modify their projections? To understand the answers, we have to understand a little bit about what makes a hurricane. Hurricanes are formed from simple thunderstorms which coalesce and grow into hurricanes (also called tropical cyclones) in the presence of different factors that have to be favorable in order to come together, stay together and go large enough to be an actual hurricane. In this sense, it needs certain factors from both the ocean (water) and atmosphere (air) to cooperate. First, the water in the ocean has to be warmer than 81 degrees F. That’s kind of the benchmark for hurricane formation potential. The heat from this warm water is what gives hurricanes their energy and is why hurricanes weaken when they have to go over either land or colder water – they lose all that heat and accompanying moisture. Second, they need high humidity levels to be present in the atmosphere, specially in the troposphere. Humidity up there helps trap evaporation from clouds, preventing its release and trapping heat inside the system. This is very important for hurricane formation. Third, they need favorable wind shear conditions. This is an area many people have heard of but don’t understand. Wind shear is a measure of how much difference or change there is in the wind’s speed and the wind’s direction when you compare low altitude and high altitude. Meteorologists consider wind shear to be the most important factor in both forming hurricanes and breaking them up when they are done. How does wind shear play such a key role? To understand, you have to remember that hurricanes are tropical cyclones – storms that have both height and width. They’re also, essentially, a collection of storms that are powered by the simple phenomenon of condensation and the release of latent heat. Ok, that sounds a bit technical, so let’s explain a little bit. If it’s not ice, water exists in two forms – gas (vapor) and liquid. The atmosphere contains water vapor which, in certain situations like the formation of storms, will condense and turn into liquid water. When this happens, there’s a release of heat because the water vapor is cooling down. The heat that was associated with turning or keeping the water into a gas has to go somewhere. Remember, heat is energy and energy doesn’t just disappear, it just gets transferred into different forms and moved to different places. In a weather situation, the water vapor in the atmosphere is constantly condensing and changing from gas to liquid (rain). Whenever this happens, the “latent” energy that was in the gas form of the water is released, usually with the result of it moving through the air on up into higher altitudes. So how does it relate to hurricane formation and wind shear? When wind shear is weak or low, this means there’s not a lot of difference in the wind’s speed and direction (mainly its vertical direction) as you go up in altitude. In this situation, it’s easier for the hurricane to grow vertically. Not only that, but if you don’t have a lot of high-altitude wind shear, heat from low altitude moves more easily into the upper air, making it easier for the hurricane to form. If there’s the opposite situation going on (stronger wind shear), the heat gets dispersed more easily, taking away the energy that the hurricane needs to grow. High wind shear hinders the formation of hurricanes by removing the heat and the moisture they need to form and grow, and it usually does this from the area near the fledgling cyclone’s center. Remember mentioning that hurricanes need a water temperature of at least 81 degrees F? There’s also a cutoff for wind shear measurements. The general rule of thumb is that hurricanes can form and intensify when wind shear is less than 20 knots. When the wind shear is below 10 knots, that’s when you get most instances of rapid intensification of hurricanes. So the classroom section of our blog is over…..now, let’s talk about what weather scientists are observing or have observed with the respect to the factors that go into revising their projections for the 2018 Atlantic hurricane season. A big problem (for hurricanes) that they have observed in recent months is the presence of strong wind shear in the Caribbean. 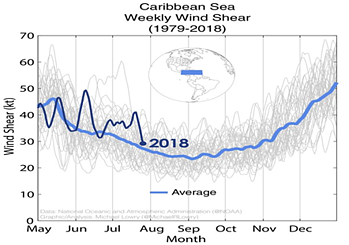 Weather scientists have observed higher-than-average levels of wind shear in the Caribbean – July had the 5th highest average figure for wind shear for any month since they began measuring that kind of stuff way back in 1979. As we explained earlier, higher levels of shear typically correlates with less hurricane activity. Another thing to watch out for is whether an El Nino weather system forms. High wind shear levels can be predictive of an El Nino formation, which meteorologists now put at a probability of 65% (that we’ll see an El Nino formation this year between September and November). Once an El Nino forms, you get an increase in the upper level westerly winds that blow across the tropical Atlantic and Caribbean. Remembering what we said about high wind shear, these higher winds break up developing storms that might otherwise turn into hurricane. So if we get an El Nino weather pattern formed, we would expect an even lower chance of seeing more hurricanes. 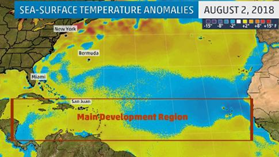 Scientists have observed that the air in the tropical Atlantic and Caribbean has been drier than usual. As you might expect, drier air doesn’t tend to be favorable for hurricane formation. Neither does overly stable air (different to what we've been talking about with wind shear), which has also been indicative of the air in the tropical Atlantic. The more stable the atmosphere, the harder it is for tropical cyclones (hurricanes) to form and develop. Water temperatures in the same region have been unusually cold, with the coldest August water temperatures in the last 35+ years. This is another characteristic that would lead a meteorologist to conclude that maybe we’re not as likely to get a bunch of hurricanes forming this year. Sometimes you might see this kind of map portraying the temperatures at the surface of the water. Areas in blue indicate cooler water temperatures compared to average, while areas in yellow, orange and even red are where water temperatures are warmer than average. The area highlighted in red is where tropical cyclones more often form in the Atlantic. It’s easy to see that there’s a lot of blue and not much orange/red. Now, these temperature trends could always change later in August and into September. But if the water temperatures remain this cold, there will be less fuel for the development and intensification of storms. 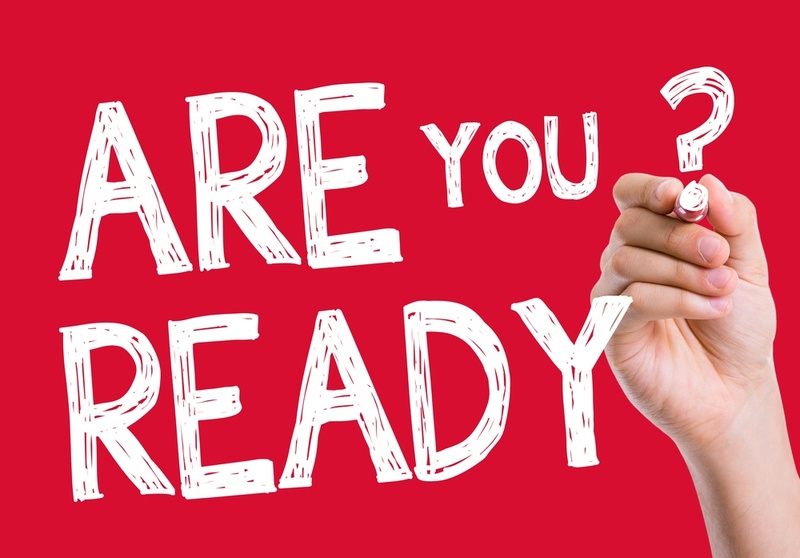 This post was published on September 5, 2018 and was updated on September 5, 2018.